While creating a new programming language, Dutch programmer Guido van Rossum was also reading scripts from the comedy series “Monty Python’s Flying Circus”. He realized the need to have a name that was short, unique and slightly mysterious, so he decided to call the language “Python”. 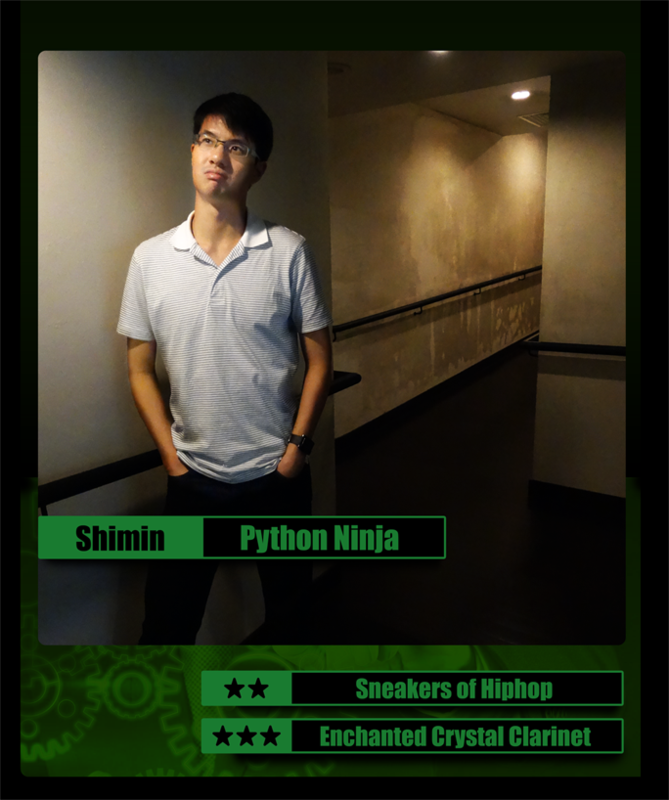 Our Python Ninja, Shi Min, is TALL, unique and slightly mysterious. His strength is his incredible flexibility. Not only does Shi Min study Informations Systems at the Singapore University of Technology & Design (which was established in collaboration with MIT), he also finds time to engage in many challenging activities, such as graphic editing, hip-hop dancing and playing the clarinet in a symphonic band. Shi Min’s creative talents and technical skills proved to be a perfect fit at Gametize, where design thinking and game psychology are combined with our streamlined technology to create gamified experiences. In Gametize, Shi Min is leading the update of our analytics dashboard.